MASON, Ohio (Ticker) - Andy Roddick could not convert any of his seven break points against Daniele Bracciali at the ATP Western & Southern Financial Group Masters on Tuesday. It did not matter. In a first-round match in which neither player lost serve, the ninth-seeded Roddick outlasted Bracciali, 6-7 (6-8), 7-6 (7-4), 7-6 (7-5), at the $2.45 million U.S. Open warmup event. Roddick, who was stunned by Bracciali in the second round at Wimbledon last year and is nursing a back injury, was two points from defeat with the Italian serving at 5-5 in the third-set tiebreak. But Bracciali pushed an easy forehand volley wide to give Roddick match point, and the American converted on the next point when Bracciali could not handle his serve. Roddick was in good position to win the first set after opening a 6-5 lead and winning the first three points on Bracciali's serve in the 12th game. But the Italian won the next five points to win the game, then won the tiebreak when Roddick pushed a backhand into the next. The American then slammed his racquet in disgust. 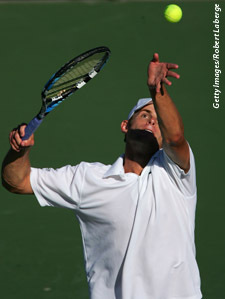 But Roddick held his own on serve, saving Bracciali's two break chances, and prevailed in the next two tiebreaks to set up a second-round meeting with Belgian Kristof Vliegen. "When you haven't played for three weeks or so, it's just tough getting into the flow of a match a little bit, especially against a guy who gives you pretty much no rhythm," Roddick said. "He's taking one ball and hitting as hard as he can. It's tough to kind of get into a groove." For a second straight week, Andy Murray got the better of fellow Brit Tim Henman. Murray outlasted Henman, 4-6, 6-4, 7-5, in the first match of the day. Last Wednesday at the Rogers Cup in Toronto, Murray beat the 31-year-old Henman, 6-2, 7-6 (7-3), in the second round en route to reaching the semifinals and seeing his world ranking rise to No. 21. After winning the first set Tuesday, Henman fell behind, 5-2, in the second. He broke Murray in the ninth game to get back on serve but was broken in the next game as the Scot leveled the match. Henman broke Murray in the third game of the decisive set en route to a 3-1 lead. But Murray broke back two games later and did so again in the 12th game to improve to 3-0 lifetime against his compatriot. "I dug pretty deep because I could have let my head get down after I got broke at 5-3 in the second set," Murray said. "And then I managed to break him straight back to win the set. When I was a break down, I knew I had the game to break but Tim was serving much better, so I knew it was gonna be difficult. But I did come up with some big shots at the important stages." "(He) hit a couple of good shots in the last game but a match of that nature, it's going to boil down to a couple of important points at important times," Henman said. "It kind of went his way." Murray next will face Swiss master Roger Federer, the top seed. Earlier Tuesday, Murray did not even allow the possibility that Srichaphan would upset Federer. "It's going to be a nice test for me," Murray said of facing Federer in an on-court interview. "I think I've played really well the last couple of weeks. I did well to come through today and hopefully I can give him a good match tomorrow." The defending champion, Federer continued his winning ways in North America with a 7-5, 6-4 victory over Paradorn Srichaphan of Thailand. Federer won 55 consecutive matches and nine titles in North America, including back-to-back U.S. Opens. His overall winning streak stands at 19 matches. Possessing a staggering 85-2 record on hard courts since the start of 2005, Federer knows that another run to the final here would equal Ivan Lendl's ATP Tour record of reaching 18 straight finals worldwide. Federer, who claimed his 11th career Masters shield last week at Toronto, is 63-4 this year - 62-0 against everybody but Rafael Nadal. The world's second-ranked player, Nadal is seeded again to face Federer in the final. Nadal won his first match at this event with a 6-7 (5-7), 6-2, 6-3 victory over 18-year-old American wild card Sam Querrey. Nadal, who had lost in the first round here the last two years and was coming off a third-round loss to Tomas Berdych in Toronto, will face Korean qualifier Hyung-Taik Lee. Fourth seed Ivan Ljubicic of Croatia dismissed Greg Rusedski, the only other Brit in the draw, 6-3, 6-4. He next will face Russian Mikhail Youzhny, a 6-2, 6-3 winner over German Bjorn Phau. Also moving on was No. 14 Tommy Haas of Germany, who dismissed Spaniard Fernando Verdasco, 6-3, 6-4. Haas awaits Frenchman Gilles Simon, a 6-4, 6-4 victor over Czech lucky loser Lukas Dlouhy. However, Berdych, the 11th seed, was upset by Swede Robin Soderling, 6-4, 6-3. Soderling will face American qualifier Justin Gimelstob in the second round after the veteran dismissed Spaniard Feliciano Lopez, 6-3, 7-6 (7-4). Also upset was No. 12 Jarkko Nieminen of Finland, who fell to Serb teen Novak Djokovic, 7-6 (7-5), 6-4. Djokovic will play Frenchman Florent Serra in the second round. No. 13 Fernando Gonzalez of Chile advanced with a 6-4, 6-4 triumph over countryman Nicolas Massu.